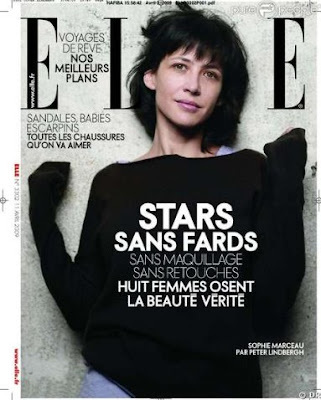 The April issue of Elle France featured a spread of 8 celebs(WITHOUT make up, or retouching): Monica Bellucci (love her), Sophie Marceau (love her too), Eva Herzigova, Inès de la Fressange,Anne Parillaud, Karin Viard, Charlotte Rampling, and Chiara Mastroianni. Photographed by Peter Lindbergh. I was only able to get the cover pics for Monica, Sophie, and Eva. I'm dying to see what Inès looks like (She's always gorgeous, with or without makeup). With a passion for fashion, an eye for style, and an utter obsession with Erin Wasson and Anja Rubik.